Onkyo unleashes three high-end AV receivers, plus a £200 micro – and much, much more | What Hi-Fi? These will be joined by a preamp/processor – or AV network controller if you prefer – called the PR-SC5507, yours for a cool £2000. But it's not all high-end home cinema: there's an upgrade for Onkyo's entry-level micro system, the CS-435UK, a £150 iPod dock complete with digital outuputs, the ND-S1, and price reductions on the TX-SR507 and TX-SR607 amps, down to £300 and £400 respectively. Naturally, Onkyo reckons the TX-NR5007 is equipped with just about everything a serious AV fan could need or indeed want. It has THX Ultra2 Plus certification, eight HDMI inputs and two outputs, DLNA networking and 220 watts of power per channel. The 9.2-channel amp boasts decoding for all HD audio formats, plusa DS Direct facility for SACD playback. ISF Calibration, Audyssey DSX surround sound and Onkyo's proprietary U.Port are also present and correct. Burr-Brown PCM1795 192kHz/32-bit DACs, TI Aureus DSP chips and Onkyo's ultra-low jitter PLL circuitry ensure the internal technology sounds suitably impressive. Out next month, it's yours for £2400. The TX-NR3007 is £700 less: the saving means you'll have to settle for seven HDMI inputs, 200 watts of power, no USB inputs and three rather than four audio inputs. The £1300 TX-NR1007 drops down to six HDMI inputs, 180 watts per channel, a different video processor, two audio inputs and no USB connections. Joining the AV amps is Onkyo's PR-SC5507 preamp/processor. Capable of controlling three rooms of home cinema action, the machine is the successor to the PR-SC886 and based on core technologies seen in the TX-NR5007. Primarily aimed at the custom install market, the £2000 network-capable device can connect to AMX and Crestron control systems and offers full audio 9.2-channel networking. Seven HDMI inputs, two outputs, HD audio and video processing, extensive switching capabilities and a host of new add-on modules mean there's plenty to play to play with on board. At the other end of the AV spectrum is the Onkyo CS-435UK micro system, complete with CD playback, DAB/FM tuners and an iPod dock. The unit has new, larger speakers in the form of the DS-A1XPs. Two-way, ported cabinets with 2.5cm tweeters and a 10cm mid/bass driver. It's £200 and is available now in black or silver, comprising the CR-435UK receiver, the DS-A1XP dock and DS-A1XP speakers. Last but not least in the 'just arrived' corner, is the ND-S1 iPod dock. Billed as a 'new breed' of dock, it boasts digital optical and digital coaxial outputs allowing you to connect to a better quality DAC. Complete with a remote control, composite video output and a 'high-precision clock to minimise jitter', the ND-S1 will be out in October, in black or silver, for £150. Elsewhere Onkyo has reduced the prices of two of its best-selling AV amplifiers. The TX-SR507 and TX-SR607 amps are now available at £300 and £400 respectively. 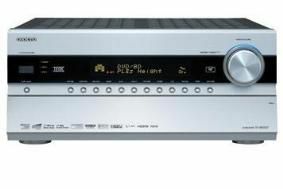 As ever, look out for reviews on these products just as soon as we can get our hands on them, and see our Blog channel for more pictures of all the new Onkyo models.